It was a reversal of fortune Tuesday evening for the UC San Diego baseball team in Cary, North Carolina. 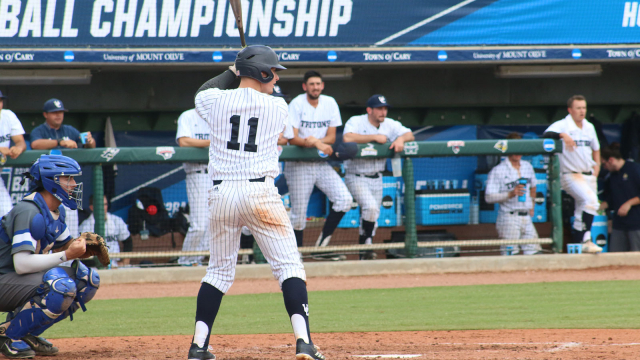 After blanking Texas A&M Kingsville on Sunday at the Division II College World Series, the Tritons were blanked 6-0 by Columbus (Ga.) State on Tuesday. It was the first time in 13 games, the Tritons lost. Last year, UCSD lost the opener made it through the loser’s bracket to reach the title game, a much harder feat UCSD coach Eric Newman said. The Tritons, for the second year in a row, left no room for errors. They will face an elimination game at 7 p.m. (4 p.m. Pacific) Wednesday against No. 4 seed Southern New Hampshire. If they win that, the Tritons will face Augustana (S.D.) on Thursday. Both the Tritons and Cougars struck out in order in the opening frame but the Cougars bats lit up in the second to put Columbas State on top. With one out, Cougars Chase Brown was walked and Robert Brooks doubled into left field to put two runners in scoring positions. After Frank Wager struck out, Gunar Drinnen delivered an RBI double to score Brown and Brooks. UCSD could not handle Columbus State left-hander Perez Knowles, who pitched a scoreless seven innings. The Tritons didn’t record a hit until the fourth inning and only recorded four hits for the night. The Tritons left 12 runners on base and the only time the Tritons were a threat was in the eighth inning when they loaded the bases with one out. UCSD’s Keenan Brigman helped Cougars reliever Payton Phillips out when he grounded into a double play.